I had one of those crazy days that we all have occasionally-freezing rain, sheer ice on our street, an appointment I could not cancel, groceries (or no supper that nite), topped off with my car skidding on our icy street into the snow bank across from our house. Someone else had been there before because there were big tire tracks right where my car entered. I got out to survey the damage (gingerly of course, because you remember, I am standing on the aforementioned sheer ice-good thing I have those ice grippy things on my boots) with my son’s words ringing in my ears. Remember the number one rule, Mom – no falling! But I am feeling like I can get myself out of this mess without calling a tow truck (expensive) or my husband, who is at work. I get my yellow plastic shovel out of the trunk and start shoveling, to no avail. The car is well and truly stuck. After about ten minutes, I see a kindly neighbor of the male variety walking towards me with a shovel in his hand. After about thirty minutes of shoveling and trial and error we free my car, introduce ourselves and exchange a few pleasantries, after which I thank him for his kindness. Then we both go on our merry way-he to his warm house and I to mine. Thanks again, Pierre. 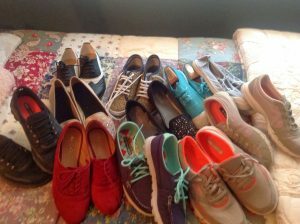 The rest of the day fell into a “what passes for normal” routine and I was able to sit down and do what I had actually planned – write an article about my feet and the challenge of finding synthetic shoes to accommodate said feet. My odd feet have been an issue for me for as long as I can remember. They are not that long, have very high arches and are kind of wide-maybe a bit like hobbit feet without all the fur. I sort of walk on the outside of my feet which causes my shoes to become a bit misshapen over time. My two brothers (bless their hearts) used to say that my feet and shoes looked like kidneys. But I try not to hold grudges, so I have moved on. When I was nineteen, I sprained my right ankle for the first time, one of many over the years – that along with some other skeletal issues have left me with very few options for footwear. So when I heard k.d. Lang mention how she hated plastic shoes, it struck a chord with me. What do vegans do when veganism becomes impractical at the very least or a health issue, for instance? 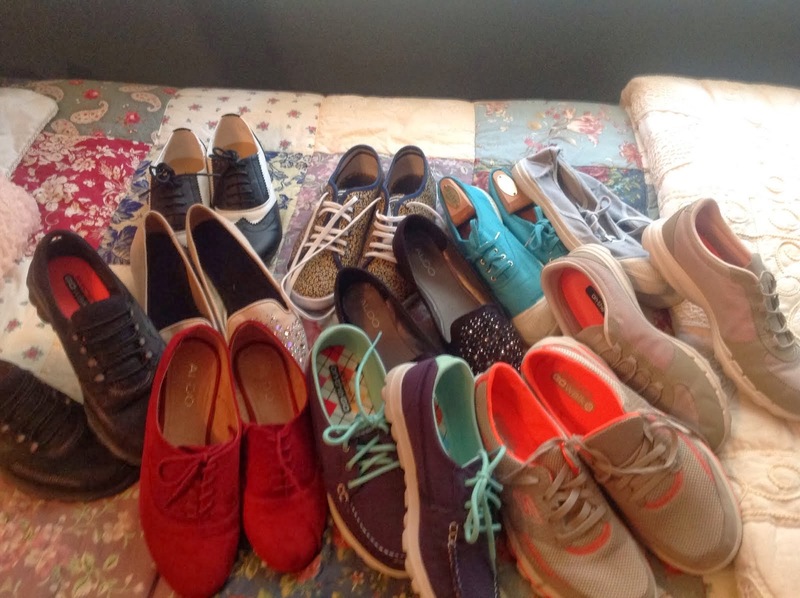 Up until this September I had a collection of very carefully chosen shoes for my funny feet-around twenty five pairs of leather shoes-you know the old jokes about women and their shoe collections. I imagine that my count was probably quite modest. I had Birkenstocks for the summer, flat shoes for casual wear and several low heeled shoes for dress-up, and a couple of pairs of winter boots, all geared for comfort and safety. But wearing this leather footwear bothered me every time I put it on. So I rounded up all of it and took it to NOVA, our equivalent of the VON, for them to sell in their thrift shop, the proceeds of which help support the wonderful nursing care they provide. So now, what to do? I need some shoes, so I started my hunt while on holiday in Victoria, BC and was directed to a shoe store with loads of synthetic shoes. My husband and I were on our way to the airport, so we were in a bit of a rush. I explained my needs to the very kind salesperson and she directed me to some non-leather shoes. I chose three pair and we raced out of there. The two pair of sneaks are great, but the pair of dress shoes are not – they are leather. I discover this sometime after I get home. I can’t take them back, so I chalk it up to experience. 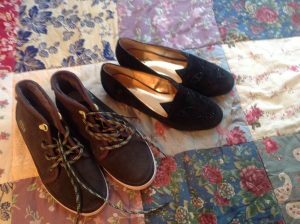 I decide that I cannot wear them even if they are cute and new. Next shopping experience happened in Ottawa, Ont. at a upscale shoe store that did, according to the salesperson has lots of non-leather shoes. See what you like and I will tell you whether or not they are leather. Based on her advice I purchased some sneaks, a pair of winter boots made by Sorrel, and a pair of fall type desert boots. The desert boots are suede and now sit in my closet, unused. This is when I went online and discovered the little tag which must be sewn into all pairs of shoes, outlining the materials with which the shoes are made. Voila, all of a sudden, I sincerely hope that I can rely on myself to buy shoes that, as far as I know, are synthetic. When making a change in your life, for yourself and for others, forgive yourself for making errors along the way as long as the intention to do the least amount of harm as we walk this earth remains unchanged. Share with others in a kind and compassionate way that which you learned about living vegan in a non-vegan world. This is such a great post. Thanks to your genes, I also have funny feet, and as you know, have long eschewed leather shoes. 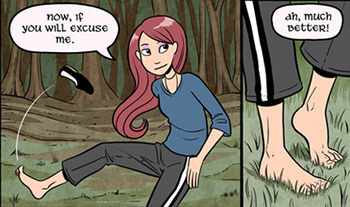 The biggest problem I encounter though… is that plastic shoes = smelly feet. More of a problem for my family than me 🙂 Thanks for the info on how to figure it out when you’re in the store!! Thanks-still lots to learn about what entices people to check out a bog, but I will keep working on it. Sorry about the funny feet! Finding good quality shoes (not made from animals) that fit my wide feet with a high instep has been a problem for me for many years. I, too, have to try the shoes on and don’t want to take a chance buying online. The good news is that there are more and more better, affordable choices. It just takes time to find them. Great subject for a post, Anne! Thanks for the positive feedback, Cindy. I think that we should go shoe shopping together the next time I am in your neck of the woods!